The Department of Sociology, Anthropology and Criminal Justice was deeply honored to receive the university-wide Programmatic Excellence Award in May 2003, making it only the second Camden department to have received this prestigious award. The award citation states that the department “works together as a seamless unity–first, by concentrating its curriculum on a key set of common skills; and second, by creating an online learning community that cuts across disciplines while binding together 250 undergraduate majors, many of whom are commuter and nontraditional students….The groundbreaking web-enhanced curriculum has a virtual abundance of instructional and research resources, from software programs to streaming audio and video presentations, to guidelines on developing citations, tables, and graphs for scholarly papers.’The combination of hands-on research tools linked to a vast database, customized virtual tours of the Internet, and an electronic course-management program immersed me in state-of-the-art pedagogy,’ says recent graduate Chaz Molins.” Click here for the full citation from the university brochure. TheDepartment of Animal Sciences at Cook College at Rutgers-New Brunswick also received the award in 2003. In September, students Kristi Napoleon and Amy Sampson and Profs. Wood and Coe made an invited presentation to the Board of Trustees Subcommittee on CCAS. In addition, Dr. Wood was invited to run a workshop on the department’s web-enhanced curriculum at the American Sociological Society’s annual meeting in August. All Sociology and CJ majors should take Methods and Techniques of Social Research (920:301) in the Spring semester if they have not already taken it. This course is a prerequisite for a number of upper-level courses, and knowledge of MicroCase and the basics of data analysis are increasingly expected in all upper-level courses. Note: the methods course also fulfills the second math requirement in the CCAS curriculum. Students graduating in May must file their “Notice of Degree Candidacy” by the beginning of February with the Office of Student Affairs. They should meet with their major advisor prior to that and have their completed major worksheets approved and signed. The tentative Summer Schedule for courses in Sociology, Anthropology and Criminal Justice is available online. Based on a treatment program Dr. Caputo developed for convicted shoptlifters in Texas, Dr. Caputo’s What’s in the Bag? A Shoptlifing Treatment and Education Programwas recently published by the American Correctional Association. The two volume work–a instructor’s and a student manual–analyzes the effects of shoplifting and offers a step-by-step program to deter further shoplifting. Dr. Caputo joined the faculty at Rutgers-Camden in 2002 after teaching at both Northern Texas University and Texas A&M. She hails from New Jersey, however, having received her Ph.D. in Criminology from Rutgers-Newark. Directed by Distinguished Professor of Anthropology Myra Bluebond-Langner, theCenter for Children and Childhood Studies continues to expand its programs in education, service, and research. On Saturday, September 13th, the campus center was filled with children and their parents for a “Summer Celebration Fair” organized by the Center’s Camden Campaign for Children’s Literacy, headed up by Rutgers-Camden graduate Angela Connor Morris (Sociology 1997). Click here for a short video of this highly-successful event (RealPlayer required) . During the fall the Center also sponsored a “Remembering Childhood” lecture series with prize-winning authors Faith Ringgold, Tanya Maria Barrientos, and Michael Chabon. Originally published by his parents, Victor and Mildred Goertzel, Cradles of Eminenceis being updated and reissued in November by Dr. Goertzel and Ariel Hanson. The book will be rolled out at the National Association for Gifted Children’s 50th annual convention in November in Indianapolis. As noted in our last newsletter, the Portuguese translation of Dr. Goertzel’s previous book, Fernando Henrique Cardoso: Reinventing Democracy in Brazil, was honored at a reception in Brazilia hosted by President and Sociologist Cardoso himself. Dr. Goertzel will offer a new course onBrazilian Society in this year’s Winterim session. Click here to learn why you should learn about Brazil (Word document). An exciting new opportunity for students during the spring will be a study tour to the South Carolina coastal islands, led by Professor Katrina Hazzard-Donald. On these islands in the 18th and 19th century there emerged a distinctive slave culture known as Gullah, with its own language and traditions. Gullah culture has been at the center of historical and sociological studies of how the legacy of African culture became part of African American culture and indeed of American culture generally. Students will stay at the historic Penn Center, now a national historic landmark which was one of the first schools for emancipated slaves and later an important retreat for Martin Luther King and other leaders of the 1960s civil rights movement. Each day will be a mix of lectures, workshops, and visits to historic sites, cultural institutions, and local events.Prerequisite: Students must be taking or have taken Dr. Hazzard-Donald’s African American Culture course (920:430) or be registered as an African American Studies major or minor. Students may register for one credit of independent study credit for participating in the tour and in subsequent outreach. The study tour is being partially subsidized by money from the Department’s Programmatic Excellence Award and by other sources. Some scholarship money will also be available. Interested students should contact Dr. Hazzard-Donald. Following on the introduction of the Master of Arts program in criminal justice in the fall of 2002, a dual-degree option is being introduced in spring 2004 that will enable students to obtain masters degrees in both criminal justice and public administration. Students who complete the 30-credit curriculum for the MA in criminal justice may go on to earn a MPA by taking 18 additional credits in public policy and administration. The dual degree program will significantly broaden the career options for CJ professionals. Special admission procedures apply to dual degree candidates, so prior to applying for admission, prospective students should plan to speak with the director of the MA program in criminal justice (Professor Humphries) and the chair of the MPA program (Professor Lang). Standing from left: Ed Figueroa, Diane Dirocco, Kim Herbert-Johnson, Dan Howard, and George Dorsey. 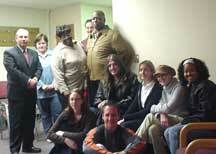 Sitting from left: Lisa Obenhaus, John Verica, Lara Lane, Danielle D’Angelantonino, Desiree Pollock, and Michael Sylvia. The long-awaited move of the Department to new quarters on Cooper Street is finally expected to take place over the summer of 2004. Major reconstruction and rennovation is taking place in the adjacent buildings of 405 and 407 Cooper Street; the two buildings are being combined into a single one that will house the Department as well as the Center for Children and Childhood Studies. In addition to more spacious offices, the building will contain a departmental student computer lab and a lounge. We expect our new building to provide better space for our students to work and study, as well as to connect with departmental faculty members and fellow students. Plan to Participate in the Annual Undergraduate Research Poster Session in April! Plan to present your research this year at the annual Undergraduate Research Poster Session, co-sponsored with the Psychology Department, in April. It looks good on your resume and it’s fun as well. So save your work and think about how to present it visually in poster format. Last year’s Poster Session attracted so many students that we ran out of food–we’ll try to be better prepared this time! Pictures of previous sessions may be accessed from the online Photo Album. A useful set of Guidelines for Visual Presentations is available at Skidmore College’s Sociology Department’s website. All sociology, anthropology and criminal justice students are invited to attend, and lunch is provided. Watch for the date in the spring! If you’re a sociology or criminal justice major and are not already familiar with it, you should check out our department’s Web-Enhanced Curriculum site, which offers a variety of resources to support student work in courses across the department’s curriculum. The departmental website is organized around its Departmental Homepageand its Web-Enhanced Curriculum Homepage, as outlined below. If you have Windows Media Player 9 (available on all campus lab computers), you may watch and listen to a “screen movie” tour of the website (you’ll need to bring your own headphones if you use the lab). Several methods and MicroCase-related tutorials have been added to theOnline Research Tutorials and Videos webpage, along with a streaming video by Dr. Coe on “Turning an Event into Fieldnotes: A Ghanaian Example.” The Department’s Web-Enhanced Curriculum was an important factor in its receipt of the university’s Programmatic Excellence Award this year. Check it out! It’s there for you to use! Comments and suggestions welcome. Dept. E-Mailings: Periodic department mailings about events and departmental news are sent to all sociology and criminal justice majors. To receive them, be sure that you have declared sociology or cj as your major and be sure that the email address you wish to use is registered at the Rutgers student directory. October 30, 2003 . Contact Robert Wood with comments or questions. Page last updated by Sociology, Anthropology & Criminal Justice at 8:03 pm August 9, 2017 . This page was printed from http://sociology.camden.rutgers.edu/news/newsletter/fall-2003-newsletter/ at 10:41 PM Thursday, April 25, 2019.